The world’s most enduring game of strategy can evoke contradictory reactions. For some, playing chess is so mind numbingly dull, be as well painting a wall with water. Strange then that others – like the Saudi mufti who recently declared it ‘haram‘ – recognise in it something potentially more harmful. Perhaps his was an extreme reaction, one expressed by an individual who would have us return to a medieval world of theocratic absolutism. As much as he might disagree, there are always two ways of looking at things, not least a chessboard, particularly if you are sitting, clocks set, opposite your opponent, planning the first few moves. The first move, in algebraic chess notation, is usually e2-e4. It is only after that inconsequential beginning, that the mind games begin in earnest. If by mind games one means consciousness expanding ‘head music’, then Manuel Göttsching has always enjoyed mind games. It also seems fitting that the sleeve of his inspirational ‘E2-E4’ album, features a chessboard. His musical career has featured some of the strangest moves in the history of popular music, it’s unique trajectory surprising many. Who, least of all Göttsching himself, would have anticipated that the journey which began with the kosmische explorations of Ash Ra Tempel, included sonic interludes with acid guru Timothy Leary and continued with his own experiments on electric guitar, would somehow eventually find its way on to Larry Levan’s turntable at the legendary NYC discotheque, Paradise Garage? From there the influence of ‘E2-E4’ would ripple outwards into new and alien territory – a dance culture with which Manuel was quite unfamiliar, and at times palpably uncomfortable. For many, the discovery of ‘E2-E4’ is a revelation. If you like me frequented the dance clubs of the early 1990s, often the pinnacle of those evenings – perhaps three quarters of the way through the DJ’s set – was a lengthy building hypnotic groove of house or techno. This could have been a slice of Strictly Rhythm style ‘Wild Pitch’ or possibly the sumptuous minimalism of ‘Acid Eiffel’ by Laurent Garnier. Best of all though had to be Derrick May’s remix of an Italian house track ‘Sueno Latino’: eleven goosebump-arasing minutes of aural bliss. It was the tune – the one where there was a coalescent transcendent moment of sheer joy and uninhibited love of the music. I soon discovered that this ‘balearic’ classic had been reworked from an original composition by a Krautrock stalwart, the former guitarist of Ash Ra Tempel, and this rather deliciously, made it sound even more remarkable. By the late 1970s, Göttsching had moved well beyond the undisciplined Grateful Dead-inspired psychedelic space rock of Ash Ra Tempel. He had discovered within the classical minimalism of Steve Reich and Philip Glass, a new way to distil new concepts of his own which he felt he could apply using his electric guitar. 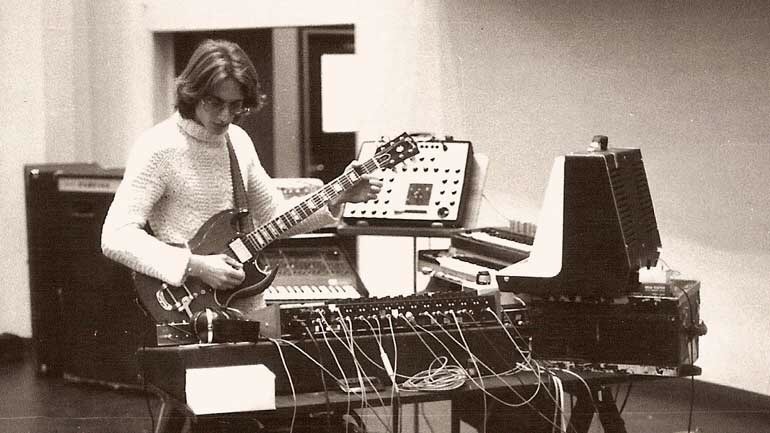 Along the way he had also become acquainted with synthesisers, experimented with a range of sounds and instruments and recognised the advantages of programming music using sequencers. Shortly before he hopped aboard a flight from Berlin to Hamburg in December 1981, he dropped by at Studio Roma, ostensibly to record some rough ideas floating around in his head, so that he could listen to them on his Walkman during the flight. He tuned his guitar from E2 to E4 (lending the album it’s title in the process), settled down for an hour and recorded one of the most influential albums of all time. Influential. That term gets bandied about all too often, but in this case it is truly deserved. As influential albums go this is close to being untouchable. Göttsching recalls making several recordings around this time but with ‘E2-E4’ he experienced “a moment where everything was perfect, the technique was perfect, everything was floating…” He didn’t release it until 1984, but it still sounds like a beautiful unrepeatable accident. The patient deliberation of each movement, the concentration on method, wonderfully mirrors the wide angle perspective of a chess grandmaster who contemplates his game plan slowly unfolding to fruition. The music comprises one lengthy fluid hypnotic repetitive rhythm. Each part or movement is given a title, by turns descriptive (‘Moderate Start’) or chess wordplay (‘Queen A Pawn; ‘HRH Retreats’) but in truth these are meaningless – it is really one continuous suite, incorporating a series of inconspicuous little shifts in instrumentation – minor surges and ebbs, nothing dramatic but something constantly evolving, moving forward. Some will feel more comfortable with the first half which is more synthesiser-led. This part in particular is the prototype for much of the electronic music produced during the following 20 years; while the second half is more guitar-led: a nod to Robert Fripp here, Mark Knopfler there, perhaps even Wes Montgomery. A bit jazz muso for some but of a piece with the rest of the music. And it is best listened to as a whole, having the capacity to induce in the listener a virtual trance like state – no doubt the reason Larry Levan would play the album in its entirety at the end of the night.